No breeder can guarantee that a mare will become pregnant to a stallion, especially within a certain period. 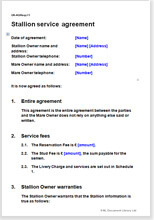 This stallion service agreement helps set appropriate expectations between the two parties, helps minimise disputes over the terms of the deal, and limits the liability of the stallion owner. This agreement is suitable for arrangements where the mare is liveried with the stallion for live service, or where the mare is artificially inseminated on the stallion owner's premises. This document is written in plain English, making it straightforward to edit. Although either party could adapt it to their benefit, because it is the stallion owner who usually needs the greater protection, we expect that it is more likely to be used by someone who has decided to keep a colt entire and who wishes to attract mares to it. This agreement has a number of features that should help prevent common disputes. This agreement sets out terms for free return (repeat service in case of failure to become pregnant), which protect both owners. It specifies by what date the mare must be not be in foal to qualify for a free return. It also includes provision that a vet will check the mare's fertility if she does not become pregnant after the first season. By providing for a reservation fee, the stallion owner can schedule visits from mares. An even flow of customers will help farm and stallion management. Often mare owners can be concerned about value for money, particularly if the service fee is large or if a foal is not born. A stallion owner should set out fee information clearly, differentiating between the service fee and care costs, such as livery and veterinary charges. If the mare does not become pregnant, or if a live foal is not born, the mare owner is more likely to understand how costs have been incurred. This agreement uses a schedule of costs to set out different fees clearly. If you have a good stallion, you will want to be sure that mares are likely to produce good offspring, particularly for the first few years, so that the results of early offspring can be used to advertise the stallion at a higher fee later on. As far as a legal agreement can, this document includes warranties that the mare is fit and healthy. "Great service - a wide choice of comprehensive legal documents at sensible prices. The documents are easy to amend and in plain English. Fantastic!" "Easy to find documents and good explanations for each What I wanted. Quick delivery. Saved money on legal fees."